As a fan of the hit British TV series Sherlock, a Bollywood version of the same sounded like a disaster. Thankfully, Samrat & Co. is watchable, but just barely. Bollywood’s Sherlock is Samrat (Rajeev Khandelwal), a detective who relieves stress by partaking in underground boxing matches. Lest the audience get a bad first impression, Samrat explains that his illicit prize money goes to charity. Never mind that boxing seems like a ridiculously dangerous pastime for a man who relies on his intellect to solve crimes. Khandelwal’s Samrat is a normal guy, as socially at ease as Benedict Cumberbatch’s Sherlock is awkward. It’s the supporting cast — like dim-witted Chakrandhar and chatterbox maid Shanti (Puja Gupta) — whose attempts to add quirkiness to the movie prove more irritating than endearing. The central mystery involves a rich man in Shimla — Mahendra Pratap Singh (Girish Karnad) — whose garden appears to be cursed. After Singh is murdered at his own birthday party, Samrat sorts through numerous suspects to find the killer. The movie’s cast is huge, and there are way too many potential suspects to keep track of. When Samrat zeroes in on Deepak (Rajneesh Duggal) as a potential culprit, I was hardly sure who Deepak was. His character is introduced while Samrat scans some CCTV footage, and they have one brief conversation before their showdown. The showdown itself includes a bout in the world’s least safe fighting arena, perched on a cliff’s edge and ringed by a wooden picket fence. The insurance premiums must be outrageous. Kandelwal’s performance is fine, but it’s not especially compelling. Madalsa Sharma is tolerable as Dimpy, Singh’s daughter and Samrat’s sort-of love interest. There’s not much to commend any of the supporting actors besides Shreya Narayan, whose character, Divya (Singh’s other daughter), is refreshingly mute. As flawed as Samrat & Co. is, it deserves credit for trying something a little different. Mystery isn’t a common Bollywood genre, so the movie at least offers a change of pace. 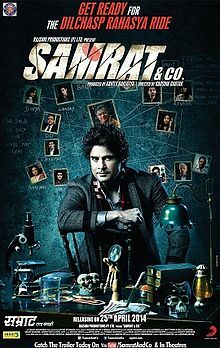 Samrat & Co. is neither great nor terrible. This entry was posted in Reviews and tagged 2 Stars, 2014, Bollywood, Girish Karnad, Gopal Dutt, Hindi, Indian, Madalsa Sharma, Movie Review, Puja Gupta, Rajeev Khandelwal, Rajneesh Duggal, Samrat & Co, Sherlock, Shreya Narayan on March 24, 2015 by Kathy.